Prior to Friday's rain, August had been a fairly dry month with precipitation values running nearly 2" below normal for the month. The officially tally at the KMSP Airport was 1.05", which made it the 4th wettest day of 2018 thus far. The wettest day was back on July 12th, when we picked up 2.13". The forecast calls for more rounds of showers and thunderstorms, some of which could be strong to severe along with locally heavy rainfall. Distant wildfires continue to burn across Canada and the Western US, which is still causing smoky skies and at times, poor air quality closer to home. NOAA's HRRR-SMOKE model suggests areas of smoke over parts of the Upper Midwest early Sunday morning. The more intense reds across the Western half of the country suggests where smoky skies will be the worst. Yep - it's that time of the year again for seasonal allergy sufferers to start loading up on the allergy meds. According to Pollen.com, pollen levels across the state have been running at high to medium-high levels and will continue through the rest of the weekend and into the week ahead. Nordic Waffel, Rainbow Cloud Roll, UpNorth Pasty Puff, Oh My! Those are just a few of the new food items at the Great Minnesota Get-Together this year. My mouth is already watering... I can't wait. BURP! Yes, the fair starts this Thursday - Uffda. Prior to Friday's heavy rain (for some), dry weather across parts of the state have helped worsen the drought a bit. As of Thursday, abnormally dry conditions climbed to nearly 48%, which is up from 41% last week and Moderate drought conditions have climbed to 9%, up from the 7% last week. Note that much of the metro is still considered to be abnormally dry. High temps on Sunday will be very warm across the southern half of the state with readings in the mid/upper 80s. Dewpoints will also be quite tropical as readings will be in the upper 60s to low 70s. Sunday will be a reminder that it is still summer! Weather conditions over the next few days look a little more unsettled than what we've been dealing with. Areas of showers and storms will be possible on Sunday and into early next week. Some of the storms could be strong to severe along with locally heavy rainfall. 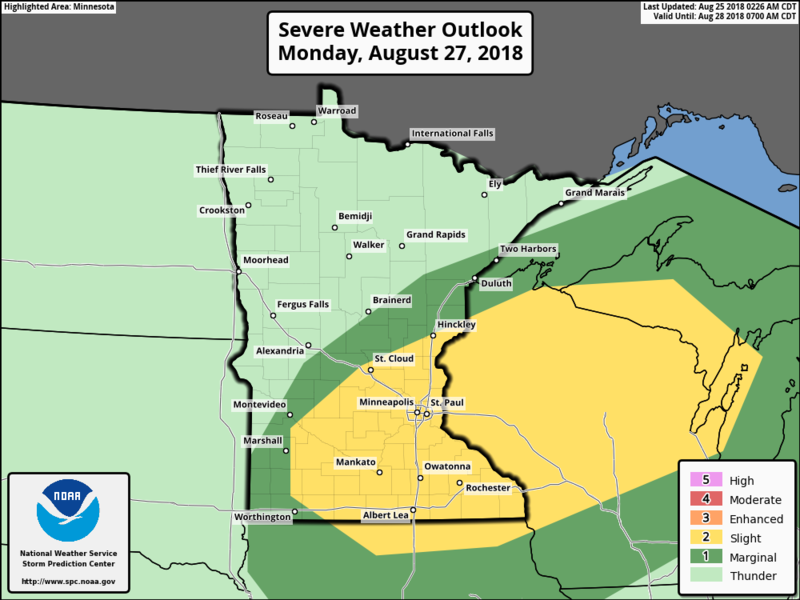 According to NOAAs SPC, there is a chance of strong to severe storms across parts of the Upper Midwest and across parts of Minnesota both Sunday and Monday. There is a SLIGHT risk of severe storms on both days, which indicates a chance of large hail and damaging winds. Stay tuned! According to the latest GFS forecast through Tuesday, areas of heavy rain can't be ruled out as several rounds of showers and storms develop. Some spots could see 1" to 2"+ across the far northwestern part of the state and also across the far southeastern part of the state. There's even a chance that some of the Twin Cities metro could get in on some heavy rain. The extended forecast through the early part of Sepetember suggests very warm temperatures with us through Monday before a cool front drops temps into the 70s midweek. It looks like we warm back into the 80s next weekend, but more 70s look to filter in as we the kids head back to school after Labor Day Monday. So Paul, Why Didn't the Sun Come Out Yesterday? I'm going to need a new helmet. You see, my office cubicle is pockmarked with small indentations - from me hitting my head against the wall. "Where's the sun, Paul? You PROMISED sunshine!" Um... the sun is still up there - we just couldn't see it. To be able to predict the daytime high meteorologists factor in expected cloud cover. A gray day can be 10-15F cooler than a sunny day. A strong June or July sun can quickly burn away the "crud" (fog and low stratus clouds) but a lower sun angle makes it less of a slam-dunk by late August. Much of Minnesota enjoyed a sunny Saturday, but the clouds didn't dissipate as fast in the immediate metro. Sorry. It's like being a weather guy in San Francisco. "What time will the fog lift?" Sigh. A stubborn frontal boundary sets off more roving bands of T-storms Sunday into Tuesday. If you missed the downpours on Friday, you get a few more shots at a free watering. 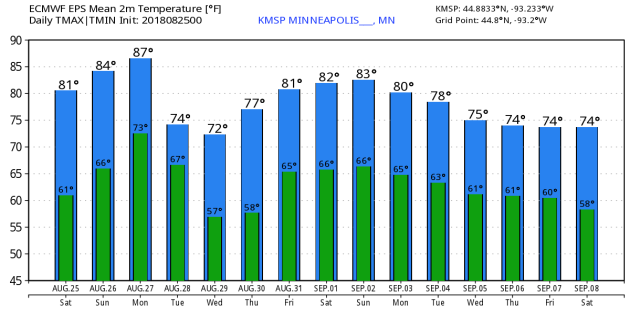 Wednesday and much of Thursday looks nice for the State Fair, but T-storms return late next week. 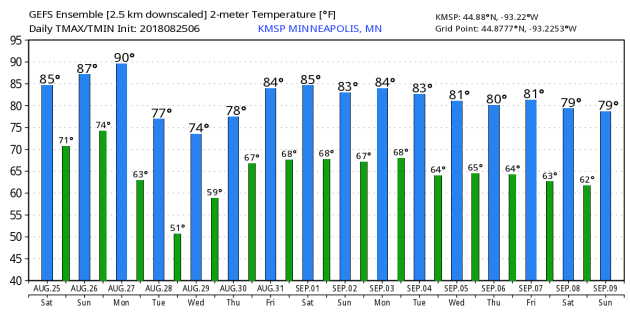 I see 80s into mid-September. Another super-sized autumn in 2018? Probably. SUNDAY: Sticky. Few T-storms. Winds: S 10-20. High: 85. 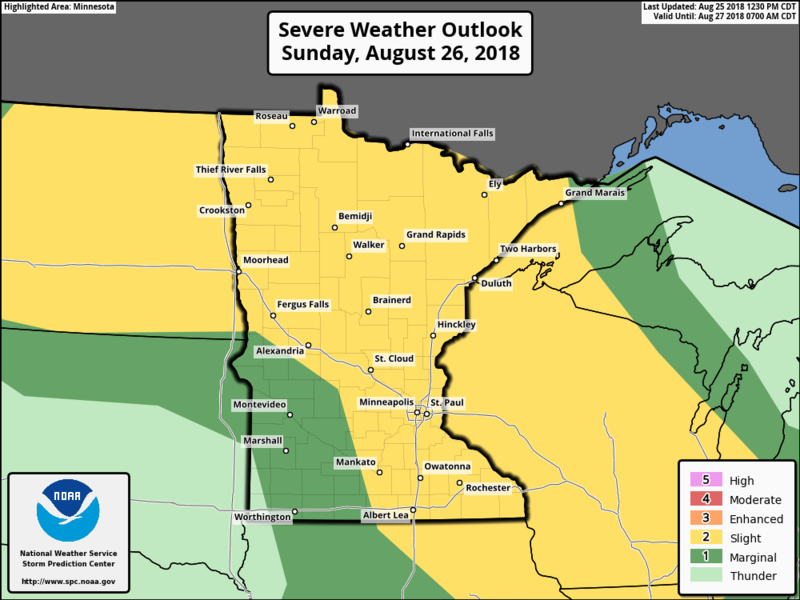 SUNDAY NIGHT: Chance of showers and storms. Winds: SSE 10. Low: 72. MONDAY: Hot sunshine. More T-storms fire up. Winds: SW 8-13. High: 88. TUESDAY: Cooler with lingering showers and storms. Winds: N 7-12. Wake-up: 67. High: 73. WEDNESDAY: Less humid. Nice day for state Fair. Winds: W 8-13. Wake-up: 56. High: 75. THURSDAY: Dry much of the day. T-storms late. Winds: SE 10-15. Wake-up: 59. High: 78. FRIDAY: Humid again. A few storms expected. Winds: S 8-13. Wake-up: 65. High: 81. SATURDAY: Damp start, then slow clearing. Winds: E 5-10. Wake-up: 63. High: 82. 1915: Unseasonably cold air leads to killing frosts across Minnesota, with a low of 23 degrees at Roseau. "On August 25 and 26, 2018, everyone around the world (except far-northern Arctic latitudes) will see a full-looking moon lighting up the nighttime from dusk until dawn. In North America, we often call the August full moon the Sturgeon Moon, Green Corn Moon or Grain Moon. In the Southern Hemisphere, where it’s the opposite season, this is third and final full moon of winter (instead of summer). Read more: What are the full moon names? It’s very hard to tell when the moon is precisely full just by looking at it. This month’s moon turns precisely full on August 26 at 11:56 UTC; that’s 7:56 EDT, 6:56 CDT, etc. (translate UTC to your time). But those times indicate only the crest of the moon’s full phase. They indicate when moon is most opposite the sun for this month (180 degrees from the sun in ecliptic longitude). To the eye, on the other hand, the moon appears over 99% illuminated for about a day before and after full moon. People around the world will regard the moon as full on both August 25 and August 26 … and so they should." "Tropical Storm Lane Continues To Impact Hawaii - Over Three Feet Of Rain So Far "
Lane has quickly weakened over the past several hours, becoming a tropical storm late Fridayafternoon local time. 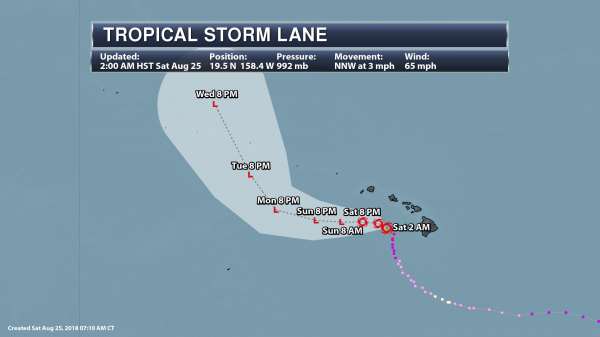 As of the 2 AM HST update, Lane had sustained winds of 65 mph and was moving to the north-northwest at 3 mph. Lane will continue on this north-northwest track for a portion of the day before turning west and picking up forward speed later today. This motion would bring the center of Lane south of Kauai later today. 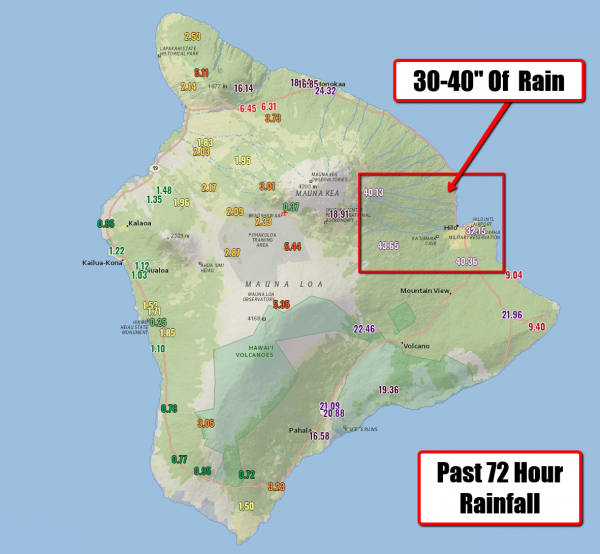 Excessive rainfall and flooding continues to be the greatest risk from Lane throughout the day, with some windward areas of the Big Island already receiving over three feet of rain. Strong wind gusts and high waves/storm surge will also occur during the day. Tropical Storm Warnings are now in effect for the Big Island, Maui County and Oahu, with a Tropical Storm Watch for Kauai. Morning Radar. Lane is looking disorganized this morning, with most of the shower and storm activity far removed from the center of circulation. This is one reason why Lane has been weakening. 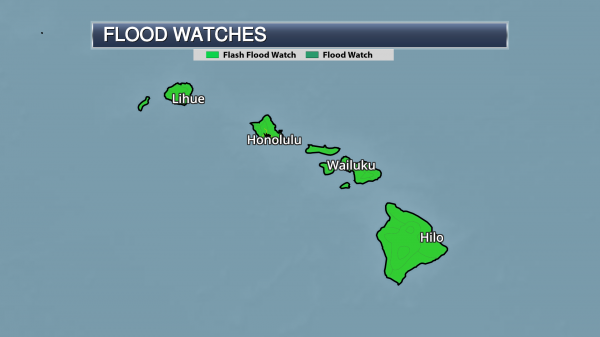 This rain is still causing flooding issues across the Hawaiian Islands. As of the 2 AM HST update from the Central Pacific Hurricane Center, Lane had sustained winds of 65 mph winds, moving to the north-northwest at 3 mph. The center of Lane was located about 135 miles south-southwest of Honolulu, or about 190 miles south-southeast of Lihue. Forecast Track. Lane is slowly making a turn to the west, and by the end of the day should complete that turn. The system should also pick up forward speed, with the center of the storm passing south of Kauai later today. Even though Lane is no longer a hurricane, dangerous weather conditions from Lane will continue to extend further out from the center of the storm. Impacts from Lane – including heavy rain which could lead to flash flooding, strong winds, and storm surge – will continue to be possible. Lane will continue to weaken, and is expected to become a remnant low in the next 36 hours. Tropical Watches and Warnings. Since Lane was downgraded to a tropical storm, all Hurricane Watches and Warnings have been changed to Tropical Storm Watches and Warnings. 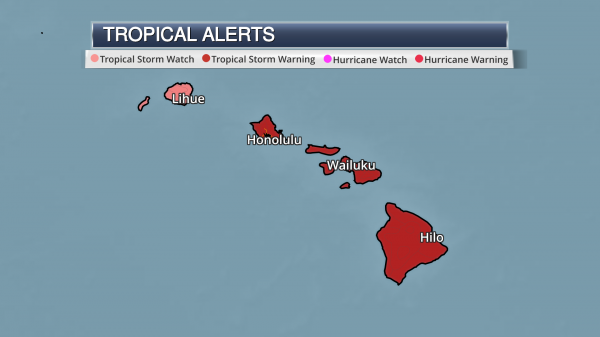 As of early Saturday morning, Tropical Storm Warnings were in effect for the Big Island, Maui County and Oahu, with a Tropical Storm Watch for Kauai. Heavy Rain Threat. 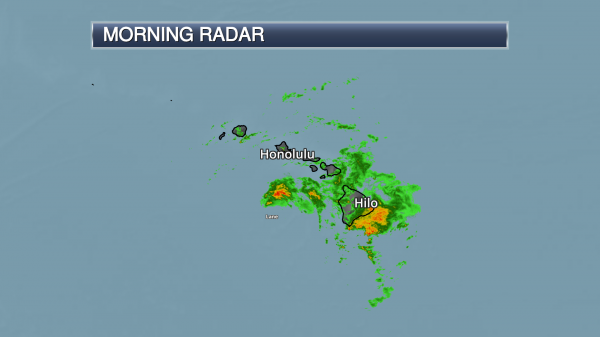 The greatest threat from Lane will continue to be heavy rain across the Hawaiian Islands today. 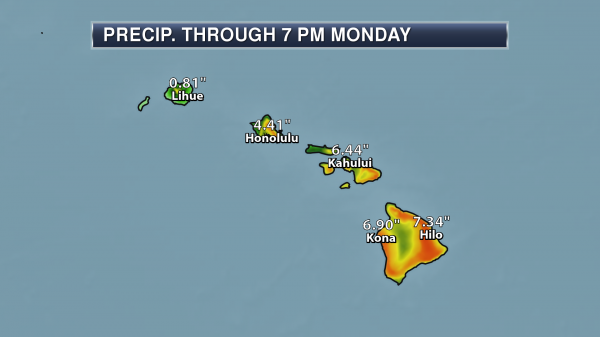 While the heaviest of the rain is expected to move westward toward Oahu and Kauai late today into Sunday, we could continue to see rainfall through the first half of the week across the entire state with deep tropical moisture in place. This rain will continue to produce the potential of flash flooding and mud slides. 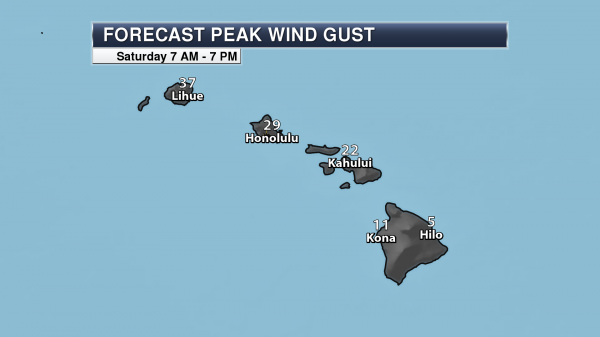 Forecast Peak Wind Gusts Saturday. Some occasional strong wind gusts will still be possible today for locations like Honolulu and Lihue due to Lane, but they are likely to remain below tropical storm force (39+ mph) for the most part. The highest wind gusts - which could top tropical storm force - are mainly expected across parts of Maui County. Storm Surge Threat. The threat of storm surge will continue along most south and west-facing coastlines throughout the day as well. Some of these areas could see storm surge flooding of at least a foot. 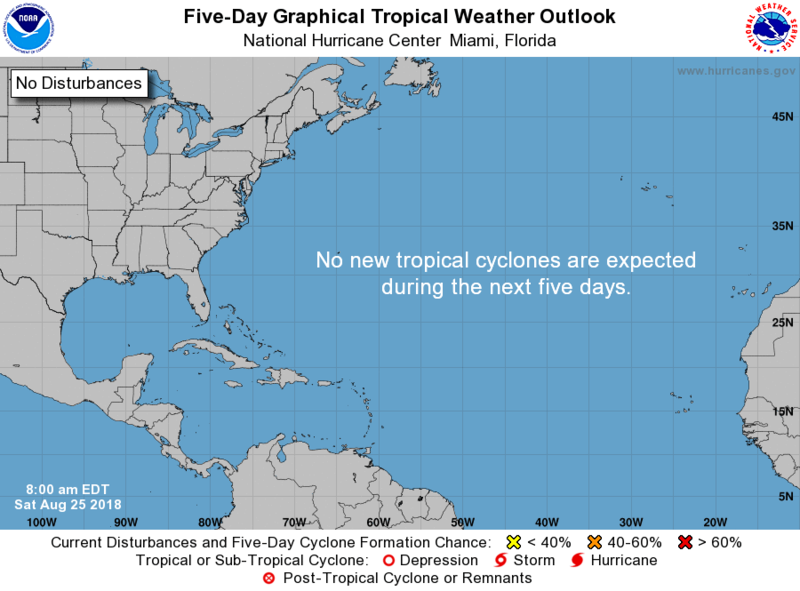 According to NOAA's National Hurricane Center, there are no new tropical cyclones that are expected during the next 5 days. Interestingly, we are quickly approaching the typical peak of the Atlantic Hurricane Season, which is around the 2nd week of September and specifically September 10th. 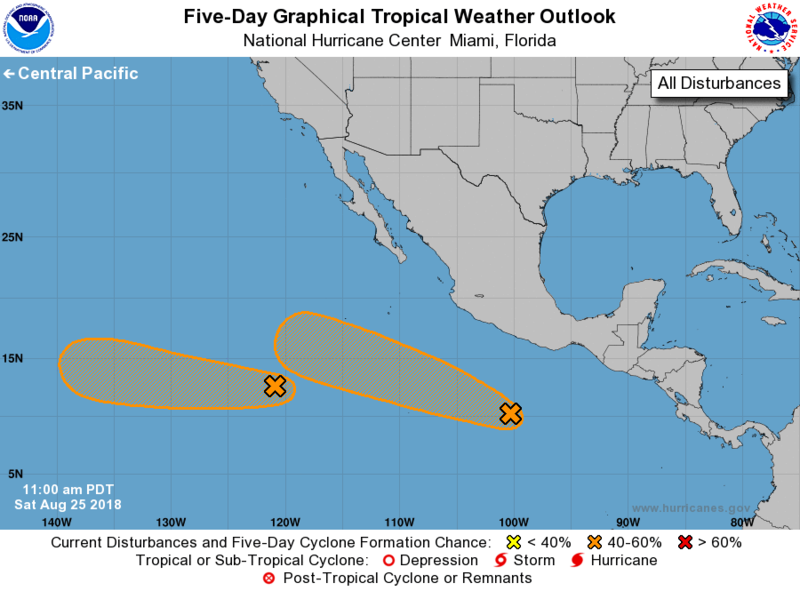 According to NOAA's NHC, there are 2 different areas of interest in the Eastern Pacific. Both have a moderate chance of tropical development over the next 5 days. This is neat map from NOAA's NHC, which shows where we typically see tropical cyclones develop during the end of August. Note that in the Atlantic, we really start to see things heat up with many waves developing west of Africa, in the Caribbean, Gulf of Mexico and along the East Coast of the US. Did you know that lightning ranks as one of the top weather related killers in the U.S.? 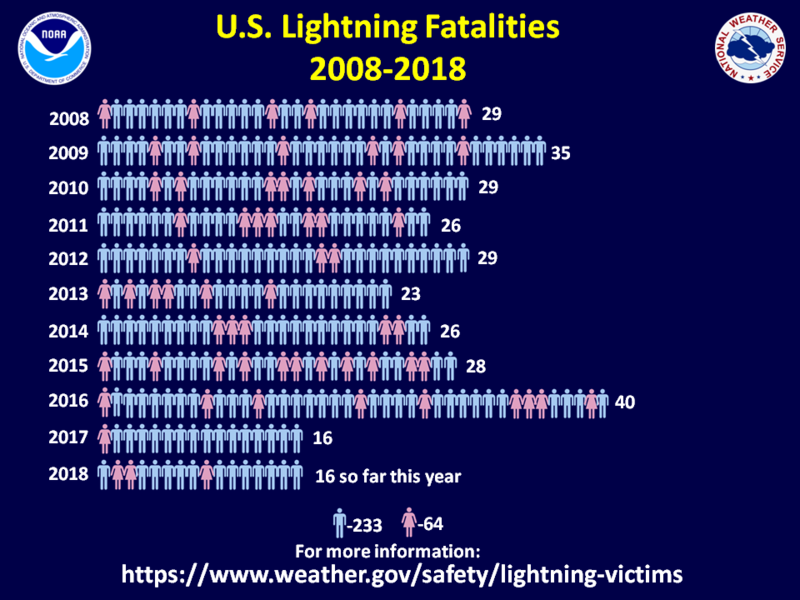 An average of nearly 50 people are killed each year in the United States and so far this year, 16 people have died from lightning; 13 have been males and only 3 have been females. Interestingly, from 2008-2017, 233 males have died, while only 64 females have died. 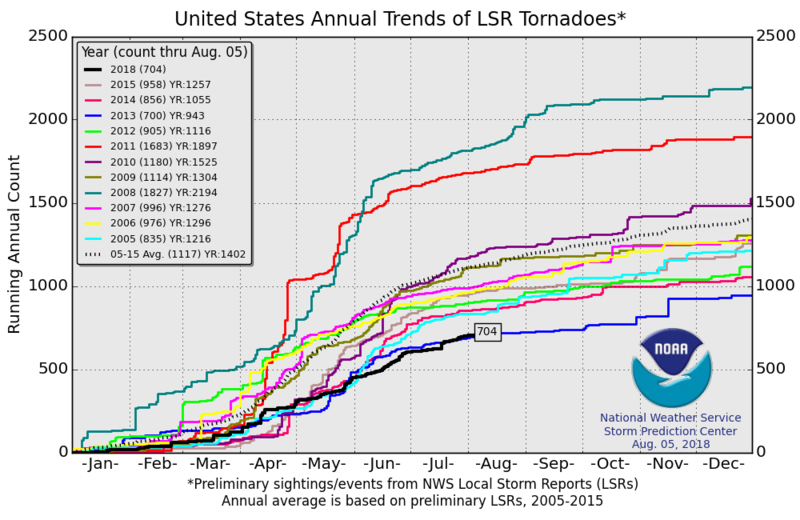 According to NOAAs SPC, the PRELIMINARY tornado count across the US this year stands at 704 (through August 5th). Note that this is less than the last couple of years, but close to what we had in 2013. Keep in mind that the short-term average (2005-2015) suggests an average of more than 1,100 tornadoes. 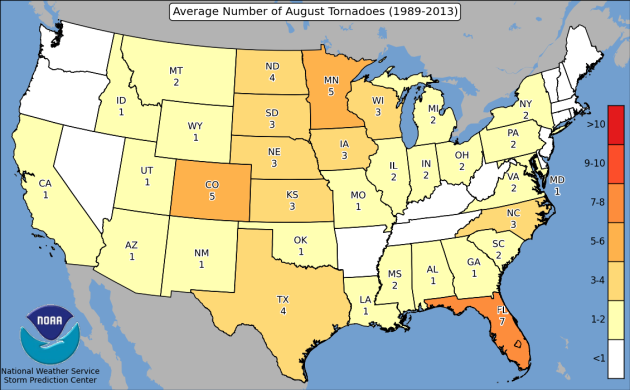 Here's the average number of tornadoes during the month of August by state. Florida sees the most with 7, while Minnesota averages 5 tornadoes. During the dog days of Summer, the tornado count typically fades across the nation. 1.) Heavy rain across the upper Midwest CONUS and northern and western Great Lakes, Mon-Tue, Aug 27-Aug 28. 2.) 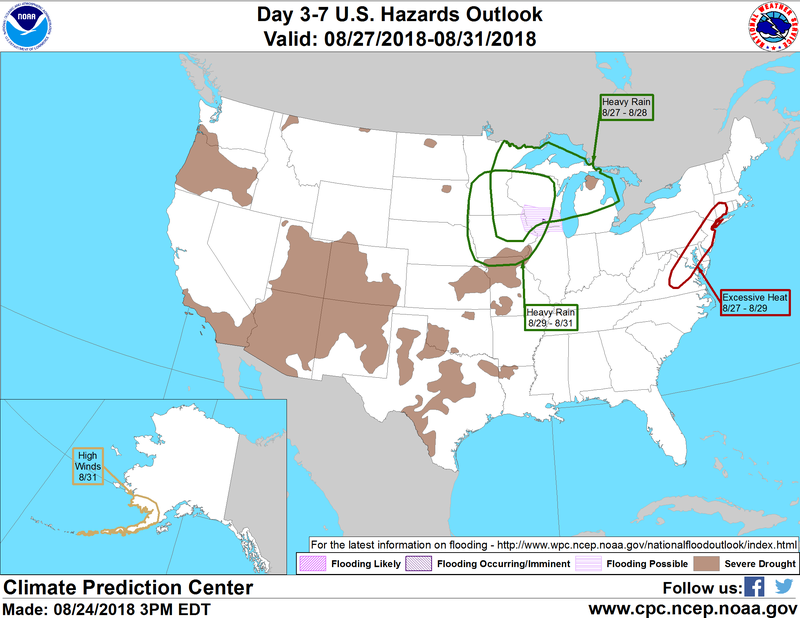 Heavy rain across the upper Mississippi Valley extending northward into the western Great Lakes region, Wed-Fri, Aug 29-Aug 31. 4.) Excessive heat for the Mid-Atlantic, Mon-Wed, Aug 27-Aug 29. 5.) High winds across southwest Alaska and the Aleutians, Fri, Aug 31. 6.) Slight risk of heavy precipitation for the western Great Lakes and upper Midwest, Sat-Sun, Sep 1-Sep 2. 7.) Slight risk of heavy precipitation for portions of the Southwest, Mon-Wed, Sep 3-Sep 5. 8.) Slight risk of excessive heat for portions of the Central Plains extending into the Ohio Valley, Sun-Thu, Sep 2-Sep 6. 9.) Severe drought for parts of the Middle to Lower Mississippi Valley, Lower Michigan, Great Plains, and western U.S., and the Big Island of Hawaii. 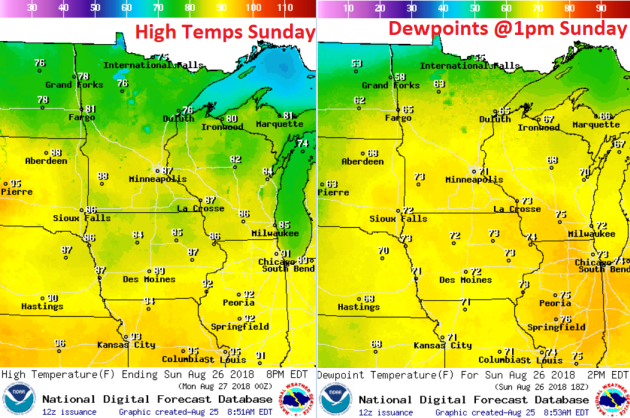 The temperature anomaly across North America on Saturday showed temperatures below avearge across much of central Canada and across the Upper Midwest. However, warmer than average weather will build in closer to home as we head through the rest of the weekend and into early next week. Here's the temperature anomaly as we head into the last full week of August. Note that warmer than average temperatures will be with us through the early part of the week, but cooler than average temperatures will move in by midweek. The weather loop below stormy weather moving into the Upper Midwest as we head into the next few days. This storm system will have the potential to bring strong to severe storms along with heavy rainfall. 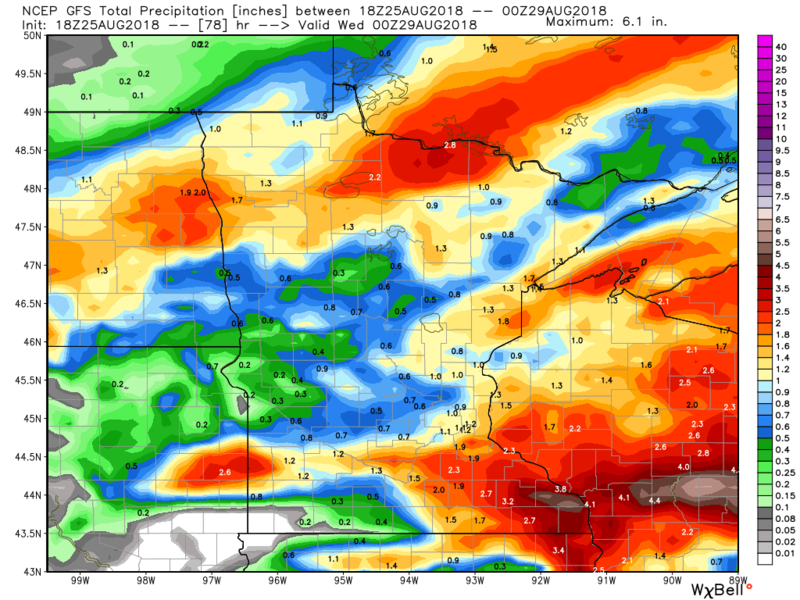 According to NOAA's WPC, the 7-day precipitation outlook suggests areas of heavy rain across parts of the Upper Midwest and the Great Lakes. Some spots could see 2" to 4"+, while folks in the Western US will remain dry through the end of the month. Here is the national drought map from August 14th, which shows extreme and exceptional drought conditions across much of the Four-Corners region and for a few areas in the Central and Southern Plains. The good news is that several locations in the Central and Southern US have had some fairly good rains over the recent days/week, so some improvement is being seen there. Also, the Monsoon season continues in the Southwest, so some locations should (hopefully) continue to see improvement there. According to NOAA's CPC, September 1st - 7th will be warmer than average across much of the nation and especially in the Great Lakes/Northeast. Meanwhile, cooler than average temps will be found across Alaska and the Pacific Northwest. "Which Worlds Will Survive When The Sun Dies?" "Nothing on Earth lasts forever, and that's a truth that even extends to all the objects we can see in our sky. The Sun, giver of light and heat to every world in our Solar System, shines on borrowed time. Currently fusing hydrogen into helium in its core, the Sun gets its energy by converting small amounts of mass into pure energy — via Einstein's E = mc2 — with every nuclear reaction that takes place. This cannot last forever, as the core's fuel is finite. The Sun has already lost the equivalent of the mass of Saturn through this process, and in 5-to-7 billion years, will run out of its core fuel entirely. After swelling into a red giant, it will eventually blow off its outer layers, creating a planetary nebula, with its core contracting down to a white dwarf. It will be a beautiful, spectacular sight to an outsider. But inside our Solar System, it will lead to catastrophe everywhere." "A 60-mile 'coastal spine' could be what protects Texas' energy corridor from future hurricanes"
"As the nation plans new defenses against more powerful storms and higher tides expected from climate change, one project stands out: an ambitious proposal to build a nearly 60-mile "spine" of concrete seawalls, earthen barriers, floating gates and steel levees on the Texas Gulf Coast. Like other oceanfront projects, this one would protect homes, delicate ecosystems and vital infrastructure, but it also has another priority -- to shield some of the crown jewels of the petroleum industry, which is blamed for contributing to global warming and now wants the federal government to build safeguards against the consequences of it. The plan is focused on a stretch of coastline that runs from the Louisiana border to industrial enclaves south of Houston that are home to one of the world's largest concentrations of petrochemical facilities, including most of Texas' 30 refineries, which represent 30 percent of the nation's refining capacity." 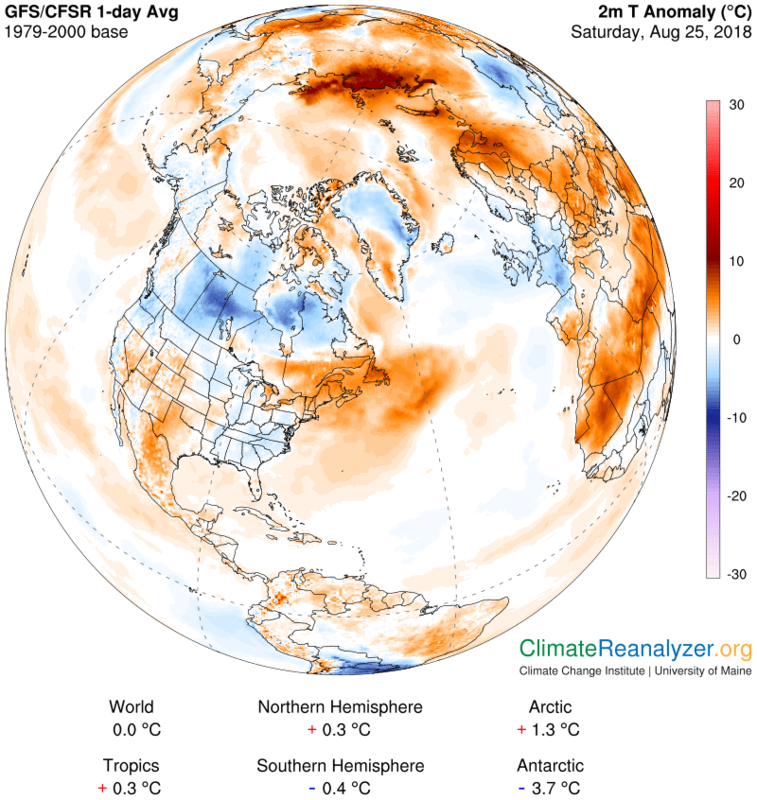 "Scientists are finally linking extreme weather to climate change"
"Until now scientists have been cagey about linking extreme weather events such as this summer's heatwave to climate change. An emerging field is changing all that. The summer of 2018 has not been a normal summer. Throughout June and July an extended heatwave set record-breaking high temperatures across the northern hemisphere. In Japan, more than 22,000 people were taken to hospital with heat stroke as the country recorded its highest-ever temperature of 41.1 degrees Celsius. In California, Portugal and as far north as the Arctic Circle huge wildfires, encouraged by months of unusually dry conditions, followed the searing heat. For years, climatologists asked to explain these kind of extreme events have fallen back on a well-worn phrase. “It’s impossible to attribute a single weather event to climate change,” the refrain goes. And they’re right. Weather is by its very nature unpredictable – extreme events will always happen in one place or another, regardless of global temperature levels, and they’re not necessarily tied to one particular cause." "How a volcano short-circuited Earth's ionosphere to trigger "Year Without A Summer""
"The year 1816 was a weird one, climatically speaking. Months that would normally be warm and pleasant were cold, rainy and overcast, leading to crop shortages across much of the Northern Hemisphere. It was linked to one of the most powerful volcanic eruptions in recorded history, and now we may know how. A new paper out of Imperial College London explains how electrified ash from the eruption could have "short-circuited" the Earth's ionosphere and triggered the "Year Without A Summer." In April 1815, Mount Tambora, in what is now Indonesia, blew its lid. After a few months of rumbling and smoking away, it finally erupted with a Volcanic Explosivity Index (VEI) of 7, the largest volcanic eruption since the year 180 CE, with the explosion reportedly heard from as far as 2,600 km (1,600 mi) away." "Tiny spacecraft are breaking out of Earth’s orbit"
"Cheap, small satellites have swarmed into Earth orbit over the past decade, cutting the cost of studying our home planet from space. Now, these spacecraft, some no bigger than a briefcase, are becoming capable enough to venture into deep space—or at least the inner solar system. Two are halfway to Mars, more than a dozen planetary probes are in development, and scientists are coming up with ever more daring ideas for doing cheap, high-risk interplanetary science. "Planetary is definitely getting excited," Lori Glaze, head of NASA's planetary science division, said last week at a symposium on small deep-space probes at Goddard Space Flight Center in Greenbelt, Maryland. Earlier this year, NASA began to accept proposals for a line of small planetary missions, with costs capped at $55 million. 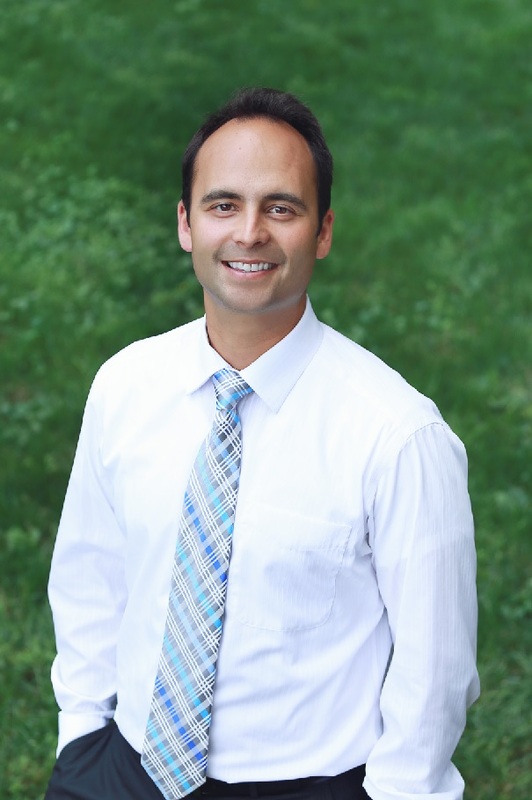 Glaze says 12 teams have submitted proposals, and the agency plans to select several finalists in February 2019. Europe, too, has plans for small planetary probes, also known as CubeSats for the cube-shaped modules from which they are built. "We see now the potential for interplanetary CubeSats," says Roger Walker, the European Space Agency's technology CubeSat manager in Noordwijk, the Netherlands."